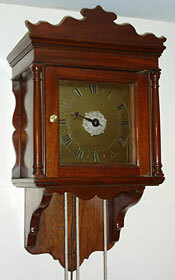 WE NOW CARRY A SMALLER, MORE SELECT STOCK OF ANTIQUE CLOCKS THAN PREVIOUSLY. 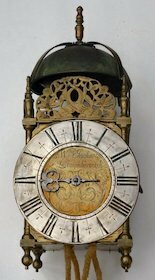 EACH CLOCK AND ITS MAKER IS STUDIOUSLY RESEARCHED TO PROVIDE A FULL RESUME OF ITS FEATURES AND ITS PLACE IN THE HISTORICAL CONTEXT. EACH IS PICTURED ON OUR 'FOR SALE' PAGES. A PRICE LIST WILL BE SENT ON REQUEST. WE ALSO UNDERTAKE BUYING AND SELLING ON A COMMISSION BASIS ON BEHALF OF CLIENTS. FOR DETAILS SEE OUR NEW PAGE ON BUYING AND SELLING ON COMMISSION. OUR OTHER CLIENT SERVICES INCLUDE VALUATIONS FOR INSURANCE (OR FOR SELLING OR PROBATE OR FAMILY DIVISION), APPRAISALS, ASSISTANCE WITH PURCHASING, OR CONSULTANCY. A handsome lantern clock made in the 1690s by William Barlow of King's Lynn, one of the earliest clockmakers in Norfolk and also a gunsmith, who was working there from 1693 and died in 1723. Only a handful of clocks are known by him. This one was made with a centre verge pendulum converted later to long pendulum. Pictured after cleaning. See article. 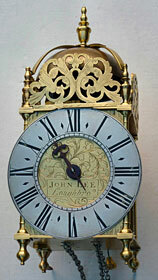 An interesting lantern clock with verge pendulum, made in the reign of George I by John Lee of Loughborough, the only one recorded by him so far. He was married there in 1718 to Elizabeth Abbington, and they had several children born between 1719 and 1723. After cleaning. See article. A very handsome lantern clock in the grand Bristol style made in the 1690s with anchor escapement by William Hulbert of Bristol. The superb engraving represents the finest of the period. Little is known about him other than that he was working between 1692 and 1716, when he took out a lease for a year on a plot of land in Marlborough Street, St. James's, Bristol. 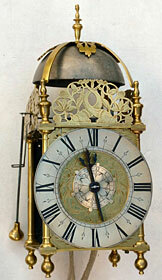 Longcase clocks are known by him but only one other lantern clock has been recorded by him. Cleaned and serviced. 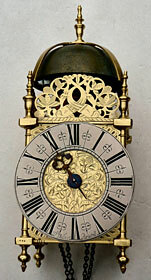 An attractive single-handed hooded clock with alarmwork with a tiny single-sheet engraved brass dial (seven inches). The clock was made in the late 18th century, is unsigned but has the maker's monogram, JW, engraved on the dial hidden by the alarm disc. Anchor escapement and long pendulum. The original mahogany Hood is in excellent condition. Probably made in the West Country. Now restored. An exceptionally unusual unsigned lantern clock of high quality dating from about 1660, clearly made in London, originally with balance wheel regulator but converted within a very few years to verge pendulum. The pendulum was fitted at the side, something very rarely seen, probably to permit retention of the alarmwork (which was later removed anyway). The manner of the conversion as well as the addition of a second hammer to strike half hours (very much a feature of French clocks), strongly suggests the clock was converted to pendulum in France. Conversions from balance wheel to verge pendulum were usually done in the third quarter of the seventeenth century, are very uncommon and are highly sought after today. Fully cleaned and serviced. Click here to see detail. See article. 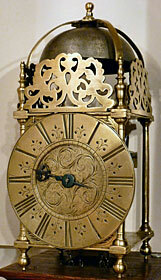 Buying Your First Lantern Clock - Some pointers for beginners: See articles page.